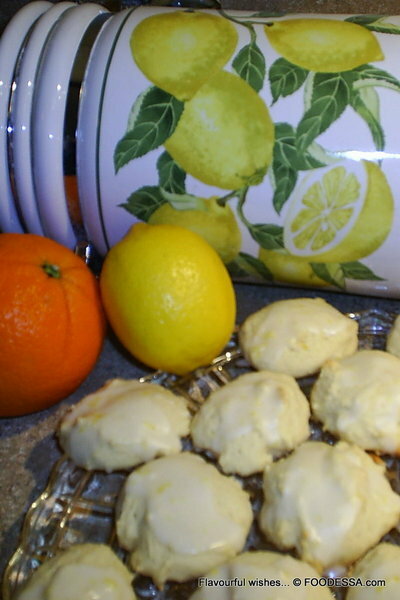 Tangy LEMONS and sweet ORANGES will delight you in every bite from these cake-like RICOTTA based cookies.
. Pre-heat the oven at: 350F/180C/Gas4 (only once the dough has been chilled for at least 1 hour). Position the rack on second level from bottom of the oven. Line two large cookie sheets with parchment paper.
. DOUGH: In a large bowl, sift together all the DRY ingredients. Make a well. Set aside. > In a medium bowl, beat the butter with the sugar until fluffy. Then, beat in the egg as well as the Ricotta cheese, followed by the portion of citrus juice and zests allocated to this part of the recipe.
. ASSEMBLY: Pour the WET mixture into the DRY one. With a spatula, combine and fold until flour disappears. Do not over mix. Cover and refrigerate for about 1 hour. Note: About 20 minutes before the chilled cookie dough is taken out of the fridge, start pre-heating the oven.
. Set up one baking sheet at the time. Then, with two spoons, roughly shape 24 walnut-sized cookie portions. Place them about 1 inch (5cm) apart. The remaining dough should be placed back into the fridge until a few minutes before the first cookie batch has baked.
. GLAZE: In a small bowl, sift the icing sugar. Then, whisk in the remaining citrus juices until smooth. At this point, make sure the glaze has a slightly thick consistency. If not thick enough, add more icing sugar.
. SETTING the GLAZE: (Only once the cookies have properly cooled). Take the same pieces of parchment used for baking and place them under the racks which you’ll be using to set the glaze on the cookies. Slowly spoon the glaze over each cookie surface. Let them rest on the racks for at least 90 minutes.
. STORAGE tips: Place them into an airtight metal container layered by parchment paper for up to 1 week. Or, better yet, preserve their freshness by packaging them into a parchment paper and into a freezer bag for up to 1 month. 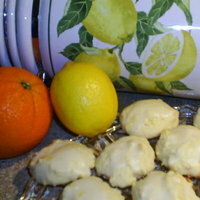 We have a similar recipe for Ricotta cookies but we use almond oil and the frosting also has almond oil for flavoring. These also sound really good and we will try them. I like the citrus flavoring. Congrats on being on the front page for recipes on Cookeatshare great job! I tried them and they are delicious. I've never seen this type of recipe before, but it looks so good. We are big lemon lovers . fabulous we love this kind of cookie in our family! fabulous we love this kind of cookie in our family! fabulous we love this kind of cookie in our family! With all those thousands recipes out there...it is truly amazing and heart warming when another 'foodie' gets to enjoy a recipe that you created. Thanks Marianna at iSicilian. Hi Patricia...thanks for the review. Your almond oil version for this cookie sounds very interesting. Do you think you'll be sharing it soon with us too?